if you’re a follower of scruffy dog on Facebook, you will have already seen the before-and-afters i post there … offering a glimpse into the scruffy dog digital darkroom. i do the bulk of my editing in Lightroom, and then any final touches in Photoshop. if you are a professional photographer looking for more information or for some unparalleled one-on-one mentoring, do check out the for photographers tab in the menu above! first up we have little Giselle who came all the way from Oklahoma with her sisters for her scruffy session. shot in the last two minutes of light, with a dazzling sunset-sky behind her, it was all about exposing properly so as not to lose any of the sky. of course, the fact that this wee pup is white certainly helps when exposing for the entire scene with snow and gorgeous sky … but in order to truly make the image glow, a certain level of editing is required. you can see the finished image a little larger in the blog entry of Giselle and her sister. in the case of Indy and Debbie, i wanted to see this image glow in the same way i saw it when shooting. in some cases, the amount of editing is more basic, as you can see from the sliders on the right of Jethro’s image. the line was removed in Photoshop but, as much as i can, i strive to keep the workflow in Lightroom … so in this case, i used the “Edit In” function, taking the file out as a tif, doing my more fine-tuned work on it, all the while keeping it in the LR workflow. like her sister Giselle, above, Mila’s image required some extra work in order to bring out that gorgeous sky … and this gorgeous girl! Poppy’s shot down by the beach wasn’t a major effort, but bringing out the beautiful sunset glow was necessary, and adding a few touches with a brush helps when it comes to the golden highlights touching the edges of the legs, as well as the beautiful glow that shines through the skin over the Achilles tendon. (2) taking it out as a tif to CS where i swapped out the sky with an image i actually shot on the way home from Woody’s session … with the finished seen below. 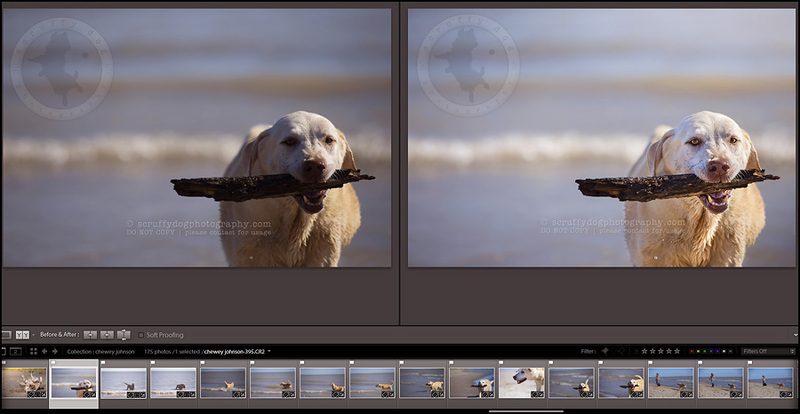 sometimes editing in LR is required because you simply missed the proper exposure in-camera … something that happens a lot more with outdoor pet photography than probably many other types of photography, since our subjects are always on the go, moving from one setting and one type of light to another within seconds. this is why, in some situations i shoot Aperture priority, but even then, there will be some misses … like Chewy unexpectedly coming over the ridge of sand during his beach session. this was the first sequence in his session, and i was not ready for him, but i loved how he flew over the ridge, so i grabbed it. and — if using professional gear — the ability to recover details in situations like this is much greater. and with this image i am able to show you the kind of recovery that is possible with Nikon. as per the scruffy gear page, i currently shoot both Nikon (D4S and D3S) and Canon (1DX) … and i can vouch for all of the reviews that place Nikon as the leader in Dynamic Range. while the 1DX is pretty amazing, Nikon pro bodies still beat it out when it comes to recovery. in the bottom left crop you can see how much of the sky appeared burned out even after LR does its automatic and basic recovery … yet i was able to recover even more through editing. with Muffin’s jumping photo, after basic editing, i needed to remove Eric’s arm and shadow … and i also accentuated that adorable wrap-around tail of Muffin’s. with Henry’s photo, it was more than just basic editing and recovering some detail from the shadowed side of his face/body … i also needed to straighten it, and artfully remove the houses behind Henry. i hope you’ve enjoyed this peek into the behind-the-scenes here at scruffy dog headquarters and what goes into our clients’ images. if you’d like to see more, consider following scruffy dog on Facebook where you can always keep up with the latest! Charlotte Reeves - Love your work Illona! Lightroom rocks! Kathie Ono - Illona: THANK YOU for having these type of posts. I know I’m wrong when I think this, but I usually think that you “old timers” at pet photography always take the perfect photo at the first crack. My head says that’s wrong, but seeing this and the fact that you go thru the same thing as I do – recovering this, cropping that, editing in PS – comforts me. I’m definitely better than last year, but I’m going to be better next year. Can’t wait to visit with you in July to help in getting better. connor - love you and your work. if ever possible to attend a session, please say the word. my niece is in Toronto working on the Pan Am Games. would be great to visit you both. Ruth - Gosh, the last one is really impressive. You’re the editing queen! Steve - If you ever produce an online course, a video, or a “How to” book, I’ll be first in line to buy it. Love your work. Unfortunately, I’m not a pro and as such don’t qualify for your coveted one on one sessions. Anyway, I’m a big fan of yours!! Fenne - very cool of you to share these, it’s great to see those transformations. Nice work!